Hopefully, if this works, various embedded link-outs will appears. An interesting article ‘Easy does it‘ posted on the Rough Type blog. The main thrust of the article is that as online access has actually narrowed access to core publications, thereby restricting attention to the high-status journals. The effect of this is to speed up consensus and narrow debate. It also makes the amusing point that poor indexing can be helpful as it widens the chances of discovering new research! 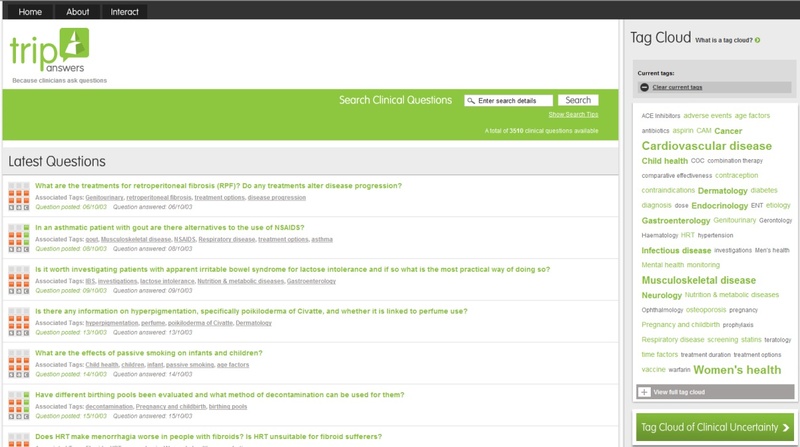 The aim of TRIP is to allow users to easily access high quality research to help guide their clinical pratice. Many years ago I was thrilled when we got searched 25,000 times in a month – that’s a lot of searches and a lot of clinicians with evidence to help support their practice.